Minitokyo »	Yuki Nagato Wallpapers » Yuki Nagato Wallpaper: Work! Took about 3 hours to do this wallpaper. First time doing a text background, thought it turned out okay. I had considered making her name stand out more, but decided instead to focus the text on "Work!" Browse Yuki Nagato Gallery: Recent | Popular. lol, her expression looks like one Haruhi would use more often. This wall is very nice,Thankyou for your sharing! Terrific wallpaper of dear Yuki. Heh, it's weird seeing Yuki angry XD Good job. WOW this is very unique pics! She had never done this kind of face ever! 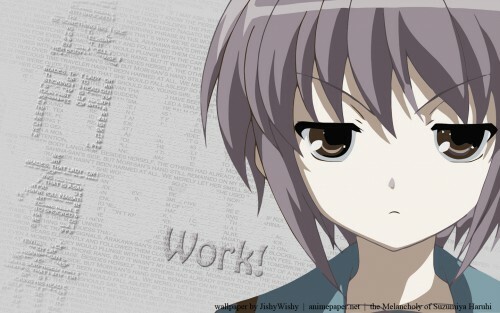 Yuki makes me work with this face. Very good wallpaper! Loved it! Thanks!